The heart of the Quasicade system has to be the Quasicon controller, one of the most original control panel designs I've seen to date. Featuring a number of unique features, such as analog buttons, the Quasicon brings quite a bit of innovation to the gaming table (so to speak). One of the first things you'll notice about the Quasicon is the sprawl of buttons: there are buttons everywhere (13 per player!). While the layout may look chaotic at first, things are actually well organized: imagine a gamepad squashed flat, and you've mostly got the idea of how things are placed. The controller is fairly large (31" x 14"), but still a bit smaller than the SlikStik Classic. The construction of the Quasicon, like that of the Quasicade cabinet, is excellent. Opening up the controller reveals an exquisite interior, complete with excellent wire routing and bundling. 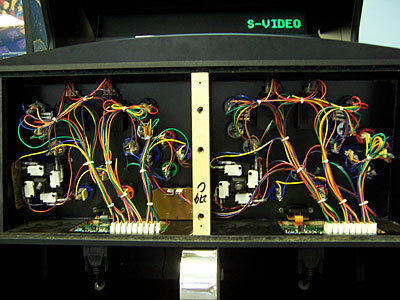 The interior is loaded with wiring, due to the large number of buttons. In fact, I'd go as far as saying the controller is "full" — there is no room for expansion, even for a homebrew "hacked in" spinner. 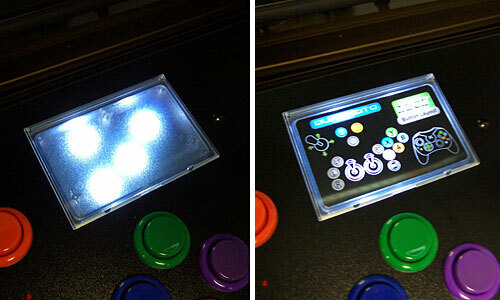 This is not the controller for a DIY type who wants to use it as a starting point for their own "frankenpanel." The Quasicon takes an unusual approach to the interface board: there are actually two of them, one for each player. 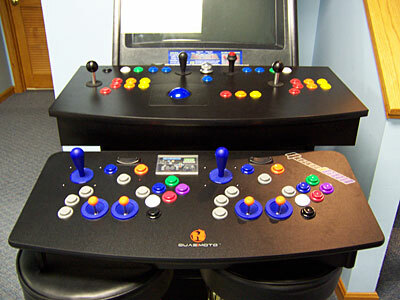 These custom boards were designed by Quasimoto and handle all the controls, including the analog buttons and joysticks. 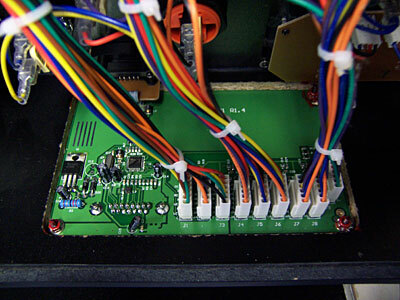 These separate interface boards means there are two cables to connect the Quasicon, which is to be expected for console controllers. It also opens up the unique possibility of connecting one set of controls to one game system (a PC, perhaps), and the other set of controls to another game system (like an XBox). To switch between different consoles or PC use, you simply swap out the adapter on the end of the interface cable. 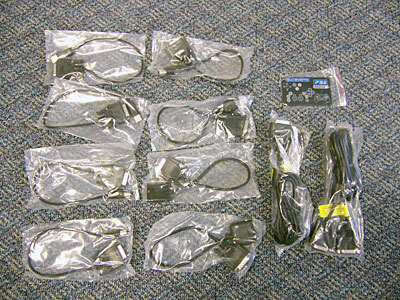 The Quasicon comes with all necessary adapters for use with a PC (via USB), XBox, PS2, and Gamecube consoles. Now that's a lot of adapters! The Quasicade experience is a bit unlike any previous arcade gaming experience (real or emulated) I've ever had. Because the controller is designed primarily for console systems and all of the controls were designed and custom-built for Quasimoto, this control panel has one the most unique "feels" I've ever encountered. One of the first unique things you'll notice is the backlit button legend panel. This is a small translucent placard holder, into which you can insert a small plastic card showing you the button assignments for the current mode (PC, XBox, PS2, or Gamecube). It's backlit by 4 white LEDs, and is extremely handy for figuring out which button, exactly, is the "Left Trigger" button. A lighted key legend on the controller! All of the buttons assignments are logical and well-thought out, in my opinion. Which is a good thing, since you can't re-map any of them. 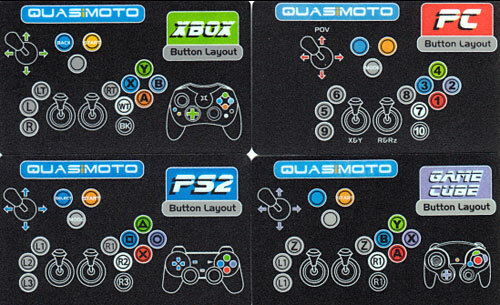 One of the more unique aspects of the button layouts is the "mode" button, which switches controllers mode from analog to digital. When this button is pressed, the analog controls are disabled and the joystick becomes the primary directional controller (a mode LED on the controller lights to indicated the current mode). This is primarily a PS2 feature — it doesn't work on the XBox or Gamecube. I'm uncertain if it's also supposed to work in PC mode, as I was unable to get it switch between analog and digital modes while connected to a PC. Another console-specific feature is the XBox expansion slot for each player, which allows you to plug in a memory module or an XBox Live headset. 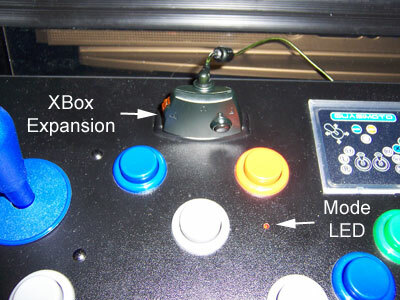 This is a great feature, especially for XBox Live use: attach an XBox wireless adapter inside the cab, and you've instantly got an arcade cabinet that you can use to battle opponents all over the world. The location of the expansion slot is a bit unfortunate, as the standard headset cable tends to drape right over your controls during gameplay. I've looked into wireless headsets, but they require two expansions slots to operate, and the Quasicon panel only has one slot per player. 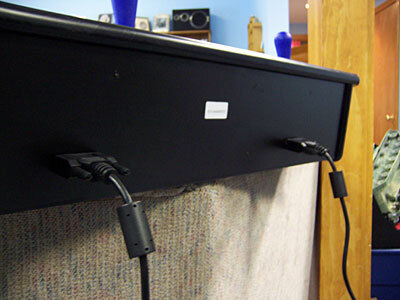 I just recently purchased a Hip Gear replacement headset with a 6-foot cord, and this solved the problem nicely. The hybrid analog/microswitch buttons on the Quasicon are something I've never before encountered. Since they were developed and patented by Quasimoto, I suppose that makes sense. 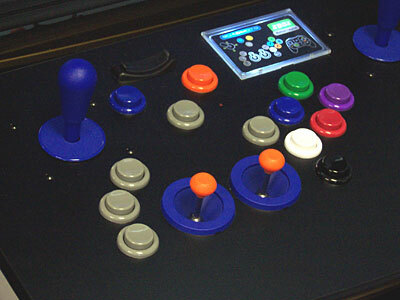 They are standard-size arcade style buttons, with a traditional microswitch in the base. What makes them unique is the addition of an analog sensor, capable of detecting 256 levels of pressure. This means you can vary the force with which you push the button, and the console (XBox or PS2) can detect the difference. At first glance Quasicon's layout is an almost bewildering ocean of buttons, and it's hard to tell where you're supposed to place your hands. After a few games, however, it starts to feel extremely natural. There are two basic "hand layouts" that I discovered while using the Quasicon: I'll call them the "Fighter" and the "Butterfly." The "Fighter" position is for (obviously) fighter and arcade-style games. In this hand position you simply grab the joystick and start pounding on the buttons. This brings up the matter of the main joystick: the joystick is mounted high enough above the panel that your arm will not hit the buttons in front of the stick, a nice touch. The joystick, however, has an unusual "feel" to it: the actuator inside is square, meaning that it's very easy to hit diagonals...a bit too easy in some games, although it tended to vary on a game-by-game basis. I tried playing Ms. Pac-Man (part of XBox Live Arcade), and immediately discovered that the standard joystick was unusable. Strangely enough, however, the analog stick provided great performance in Ms. Pac-Man, with great U/D/L/R control. The "Butterfly" position is how you'll play most console games, using your thumbs and index fingers to grip the analog sticks while you use your other fingers to hit the buttons. You can even just use your thumbs to control the analog sticks. This hand layout works well in most console games, although you'll quickly discover that your ring fingers are getting a workout! The analog sticks are a joy to use (pun intended). They are at the perfect height for thumb/forefinger use, and are smooth and precise, with a small "bump" when passing over an axis which helps ensure accurate U/D/L/R movements. These joysticks are the kind of controls you find yourself fiddling with even when you're not playing a game, just because of the way they feel in your hands (as an example, the Tempest spinner is another controller I've often found myself "fixated" with). For FPS (First Person Shooter) games, the Quasicon layout can make things a bit difficult, as it can be hard to work both analog sticks and push button combos, but I was already having problems playing console FPS games using the standard gamepad, so I don't know how much of it is the controller and how much of it is my own ineptitude (I'm a traditional mouse & keyboard FPS player, and I'm finding it very hard to adapt to "gamepad style" controls for these games). You do adjust to the Quasicon, however: my son initially disliked the Quasicon panel compared to the standard XBox gamepad, but within a day or so put away the gamepad and now refuses to use anything but the Quasicon.